to your Mac, PC, or iPad. No matter whether you are playing a simple piece from an instructional book for beginners or a piano concerto for which HCX provides a virtual orchestra, you’ll enjoy an intimate musical experience that kinesthetically connects to your fingers to the music. NOTE: Home Concert Xtreme for Mac and PC is available for purchase on this website. Home Concert Xtreme for iPad must be acquired through Apple’s App Store. Click here for Home Concert Xtreme 3 for iPad (current version). 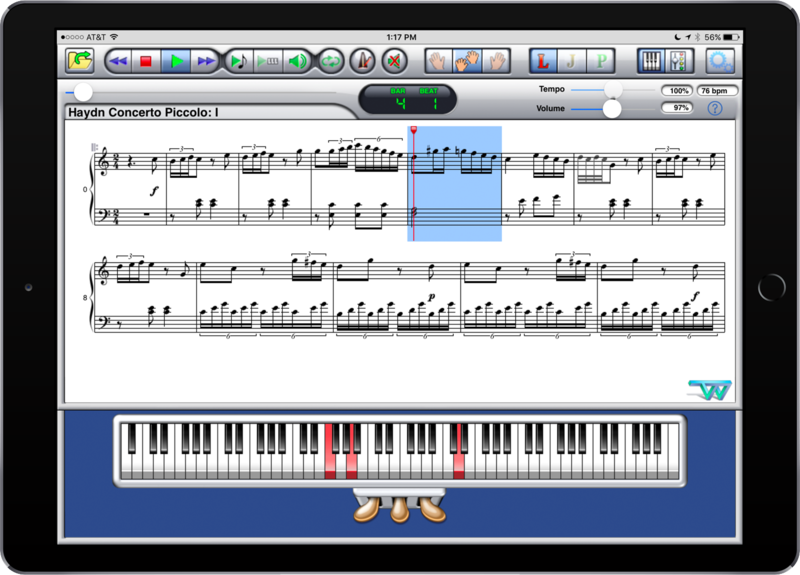 Click here for Home Concert Xtreme (legacy version) for iPad—supports iPad 1. In other words, you are the soloist and Home Concert Xtreme is the conservatory-trained conductor, orchestra, and page-turner! Home Concert Xtreme is compatible with thousands of commercial and free MIDI files as well as MIDI files that you make yourself. 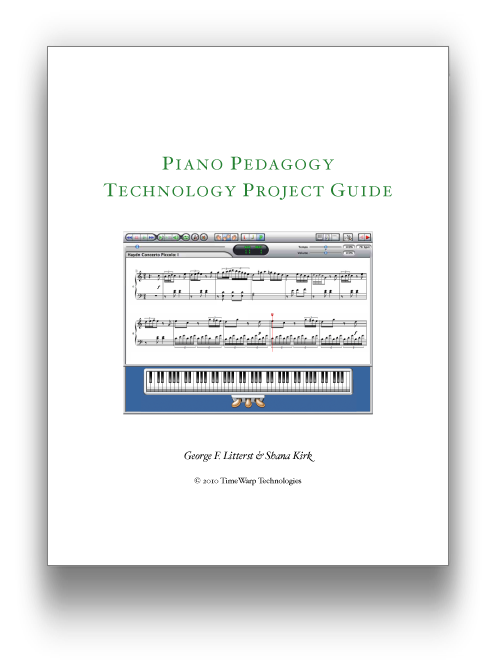 In particular, it is compatible with the MIDI files that coordinate with the most popular piano teaching methods as well as dozens of piano concerto MIDI files and more. 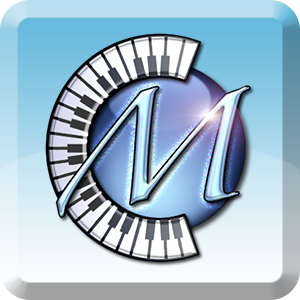 MIDI files available for sale on this website are optimized for use with Home Concert Xtreme. Imagine a program that plays along with you as if it were watching your hands. You speed up, so does it. You’re at the end of a page, it turns the page for you. You jump back eight measures, and it knows where you are. Home Concert Xtreme is TimeWarp’s award winning MIDI score-following program and is compatable with thousands of MIDI files. It knows how you play your music and is your perfect accompanist. 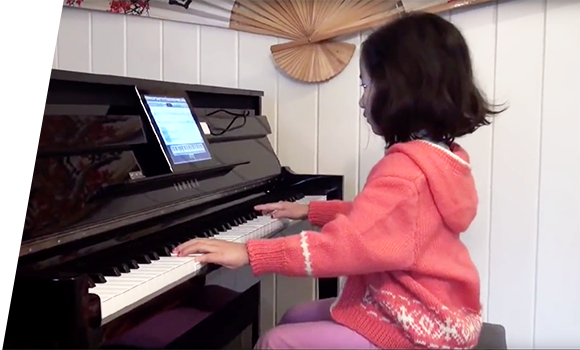 Home Concert Xtreme is available for Mac, Windows, and iPad and has been honored with the MTNA Frances Clark Award, given to products that change the face of piano teaching. Lead your own band or orchestra with Home Concert Xtreme as an accompanist, rehearsal tool, or music tutor. 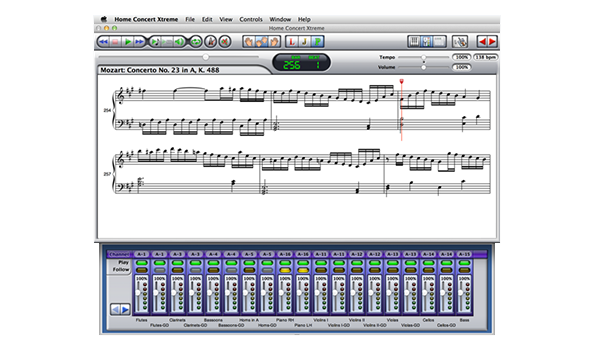 Home Concert Xtreme makes MIDI files respond to your keyboard playing. It turns pages automatically. You speed up, it speeds up. You jump to another place in the music, and it jumps there and keeps following. Home Concert Xtreme is compatible with thousands of commercial and free MIDI files, as well as properly-formatted MIDI files that you make yourself. When you load a MIDI File into Home Concert Xtreme, the app shows one or two tracks in notation (such as piano left- and right- hands). If you connect a compatible MIDI keyboard, it will expect you to play the music you see on screen while it plays all the other tracks. As you play, Home Concert Xtreme determines your location, tempo, and dynamic expression, musically coordinates the accompaniment tracks to match your playing. In other words, you are the soloist and Home Concert Xtreme is the conductor, orchestra, and page-turner. Learn Mode: Home Concert Xtreme waits for you to play the correct note. Jam Mode: Home Concert Xtreme plays the accompaniment tracks at tempo – you have to keep up. Perform Mode: Home Concert Xtreme follows your tempo and jumps to another part of the piece if you jump. Practice Loop: mark a section of the piece for repetitive practice. Metronome: If you need a metronome, Home Concert Xtreme supplies one. In most cases, you’ll probably agree that the accompaniment tracks supply an excellent musical metronome. Home Concert Xtreme comes loaded with sample MIDI files from a variety of publishers to get you started. This is a fully working version of Home Concert Xtreme that is limited to use with five built-in MIDI files. 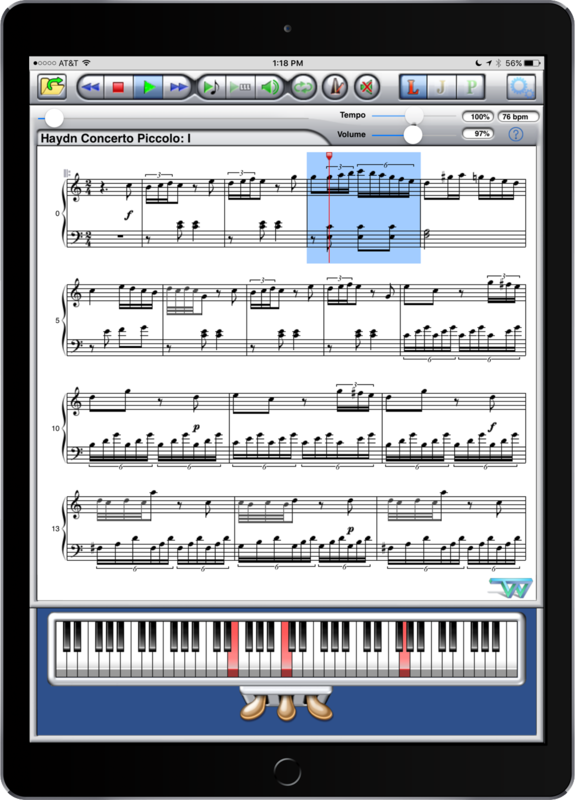 This is the PDF user guide for Home Concert Xtreme 3 for iPad. It is included inside the app itself. NOTE: This guide can also be used as an updated guide for the legacy Home Concert Xtreme as most of the features are the same. In particular, users of the legacy version of HCX will find the updated instructions for importing MIDI files to be helpful. This is a free but unsupported utility for splitting one track of a MIDI file into two tracks based on a designated split point. 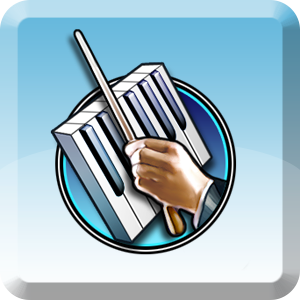 In simple cases, this app can be useful for splitting a single piano or keyboard track into two tracks so that the notes are displayed on two staves in Home Concert Xtreme. A compatible version of Java must be installed on your computer in order to use this application. Minimal documentation is included. Be sure to back up your MIDI file before using this application! George Litterst demonstrates how to set up a MIDI keyboard for use with Home Concert Xtreme. Learn how to connect your MIDI-equipped piano or keyboard to your iPad! Home Concert Xtreme 3 for the iPad to the next level! I have Home Concert Xtreme on my computer, and I just got an iPad. Can I use it on both devices? The iPad requires a separate version of Home Concert Xtreme which is available in the iTunes Store. The same is true for all other software products which exist in Mac/PC versions as well as in an iPad version. How do I register my copy of Home Concert Xtreme? How do I find my Home Concert Xtreme serial number? If you purchased a physical copy of Home Concert Xtreme, the serial number is on a label inside the front cover of the disk case. If you ordered online, your serial number was automatically assigned and is already associated with your account. What are the limits of the Demo version? The demo only works with the 5 built-in MIDI files, and you cannot save changes or edits to these files. How do I download a Demo version of Home Concert Xtreme? Will Home Concert Xtreme run on my Netbook? Probably. Since there are so many kinds of computers in this category, it’s impossible for us to unequivocally say for sure. Netbook users, for instance, may find that they are limited to smaller score display choices and other display issues due to the smaller and lower-resolution screens on some models. We have also discovered that Windows Starter 7 is missing some components needed by Home Concert Xtreme. In most cases, an intermediate-skill PC user can install these components separately. What kind of keyboard works with Home Concert Xtreme? 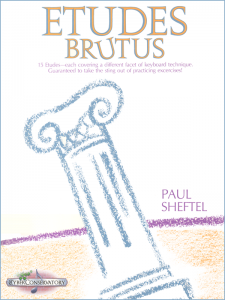 Complete General MIDI (minimum) sounds for playing orchestrations. What kind of computer do I need to run Home Concert Xtreme? Any relatively modern Macintosh or Windows computer can run Home Concert Xtreme. The recommended display resolution is 1024×768. How do I connect my computer with my keyboard? To properly connect a MIDI Interface, plug the MIDI IN plug on the cable to the MIDI OUT port on the keyboard and the MIDI OUT plug on the cable to the MIDI IN port on the keyboard. In other words, MIDI flows OUT of your computer and IN to your keyboard and vice versa. If your keyboard has a USB “to host” port, this probably means that the interface is built into the keyboard itself. In this case, you only need a basic USB cable (the same kind you use to connect a printer, for example). You may also need to install a driver from the keyboard manufacturer for this to function properly. Does Home Concert Xtreme support MIDI thru? What kind of files work with Home Concert Xtreme? Home Concert Xtreme works with both Type 0 and Type 1 Standard MIDI files. So, you can open just about any MIDI file you create, find on the Internet or that you purchase. Please be aware that some MIDI files are created with more performance detail than others. First, a MIDI file has almost no music notation information in it. 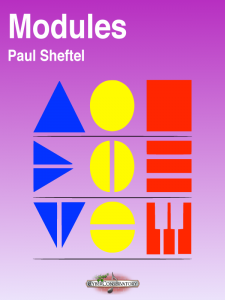 A MIDI file basically consists of key signatures, time signatures, and performance data. 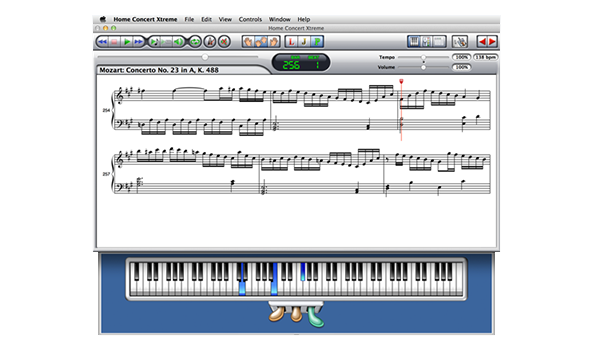 Home Concert Xtreme uses the key and time signatures in the file and then transcribes the performance data into music notation. Home Concert Xtreme does a pretty good job of transcribing, and Home Concert Xtreme offers you features for further enhancing the notation display. However, the display is not going to look good unless the MIDI file is organized to logical beats and barlines. Fortunately, most MIDI files are organized to logical beats and barlines, but occasionally you run into one that was freely recorded without reference to a metronome. In such a case, the notation looks incoherent. (You may still use these kinds of files for a play-along experience, but you’ll need to use a printed score in tandem). For the keyboard tracks to show correctly in notation, you need to work with MIDI files that have the treble and bass parts split into separate tracks. How do I make my own MIDI files to be used for Home Concert Xtreme? Put the left- and right-hand piano parts on separate tracks (or staves). When you save the MIDI file, save as a Type 1 SMF. 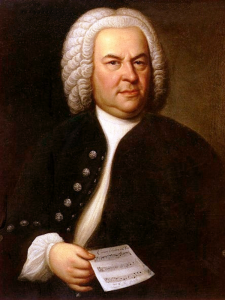 Make sure that the piano tracks are assigned to a unique MIDI channel and that any accompaniment tracks are individually assigned to unique MIDI channels. Use proper time signatures and keys signatures. In the case of key signatures, be sure to designate major or minor as appropriate. If you use a sequencing program to record the tracks in real time, record to a metronome and then quantize the tracks afterwards. Make sure that there is an appropriate patch change placed at the beginning of each track. Put the drum kit track, if any, on channel 10. Make sure that your file has a General MIDI Reset message near the beginning. Can I print the manual? The tutorials are in the form of HTML files. Therefore, printing is handled by your web browser. Each help page is actually comprised of several html pages that are organized into frames. Only the active frame will print. For example, if you have used the column on the left side to navigate to a particular topic and then use the Print… command, only the list of topics on the left will print. To make the main body of the tutorial text active, try clicking in the main body of the text. Then use the Print… command. How does Home Concert Xtreme help me learn? Home Concert Xtreme is created specifically for learning and performing keyboard repertoire. After you have chosen MIDI-based materials (see our “finding MIDI” guide), we suggest a few approaches to using HCX in learning new music. First, you may want to listen to the music you are about to learn. Do this with the PREVIEW feature. Second, you probably want to simply start learning the notes slowly. For this, use the LEARN mode. You may practice with either one hand at a time or both hands. Learn mode is often most effective in small sections. 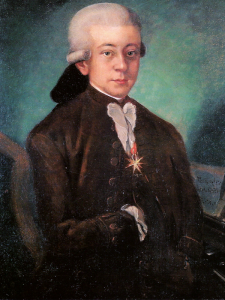 After you are comfortable with basic note-reading, move on to JAM mode. (Many teachers actually recommend doing this first, as sight-playing). In Jam mode, you’ll have to keep up with the accompaniment–it won’t stop just because you might miss notes! You may want to choose a slower tempo and gradually increase as you improve. Again, it’s helpful to do this in small sections. Speaking of sections, you will find that some areas are harder than others. To keep yourself focused, select a region of music and mark it as a Loop Region (right click in the selection to choose “Set Loop Region”). Then, when you engage the loop feature, you’ll only be able to practice just that section of music. Start slowly, then gradually increase the tempo as you improve. When you are ready to play the piece expressively, use the Perform Mode. Perform mode gives you the flexibility to speed up and slow down (rubato), and makes sure the score and the accompaniment follows you as you play. You can adjust the sensitivity of Perform Mode in the Preferences. At any point along the way, you might want to listen to your own playing objectively. To do this, click the Play Performance button. If you’d like to compare any of your previous 10 performances, you may find them in the Controls menu. Turn on the optional keyboard display to watch for any notes you may have missed–they will appear in red. Can I use Home Concert Xtreme as a performer? Definitely! Pianists worldwide use Home Concert Xtreme to have an interactive, well-lit score, as well as to play along with band and orchestra accompaniments. 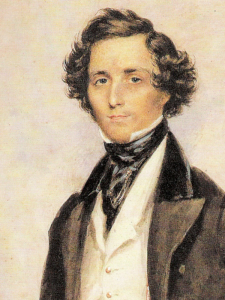 HCX has even been featured as the “virtual orchestra” for concerto festivals. I play another instrument besides piano. Is Home Concert Xtreme for me? How can I use Home Concert Xtreme with a college piano pedagogy class? Does the Home Concert Xtreme display the piano track on a single staff? Home Concert Xtreme can display any single track on a single staff. In addition, Home Concert Xtreme can display as many as two tracks at a time, each on its own staff with independently assigned clefs (which you can freely change). 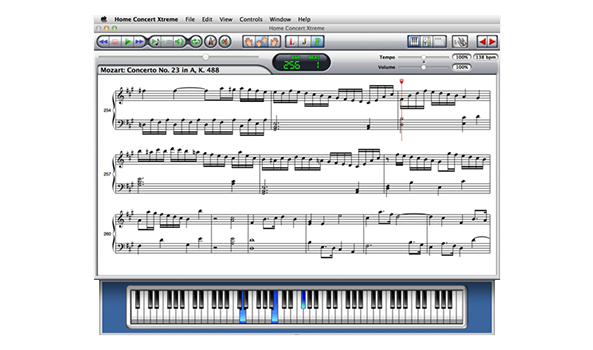 Most commercially-authored MIDI files that are designed with apps like Home Concert Xtreme in mind split the piano or keyboard part into two tracks for the purpose of notation display. Be sure to check the Mixer to see if there are two piano or keyboard tracks. If so, be sure to set both as “Follow Tracks” in order to display the two staves. If your MIDI file has all of the piano or keyboard notes on a single track, you will need to split the track into two tracks using a MIDI editor (a.k.a. sequencer). When you do, be sure to name both tracks in a helpful manner, assign them to the same MIDI channel, and export the file as a Type 1 Standard MIDI File (SMF Type 1). A Type 1 SMF preserves track names and allows multiple tracks to be assigned to the same MIDI channel. In simple cases, you can use the free Keyboard Split utility app for Mac or PC to split the piano or keyboard track into two tracks. This app lets you choose the split point. Keyboard Split is a free but unsupported Java application that you can download from the Demos & Downloads section of this page. Why can’t I see two voices on the same line? The current design of our program is such that we avoid excessive display of rests and we represent the notes on each staff as though they were part of the same voice. We realize this is not ideal for the practice of more sophisticated repertoire and encourage advanced players to use Home Concert Xtreme in tandem with reliable print editions. How do I get rid of ledger lines? My score has incorrect note values. What’s wrong? All the notes are on the same staff. What can I do? You may run into MIDI files in which the left and right hand parts are recorded onto the same track. Sometimes this requires editing in a sequencer (or contact the manufacturer of the files), but often you can make a more usable version with TimeWarp’s free Keyboard Split utility. Why doesn’t the score display look like my printed score? MIDI files do not contain the actual score of a piece. Rather, the data in a MIDI file represents the performance information about a specific rendering of a piece. Therefore, what you see on the display in Home Concert Xtreme is exactly what was played (or step-entered) into the file. So whenever you see slightly incorrect note-values or lots of ledger lines or wrong clefs, this is simply how the file was created. How do I change the clef of a specific passage? I can’t make changes (fingerings, text markings, etc.) in certain MIDI files. What’s wrong? How do I display a different instrumental part in the score? You may display any one or two instrumental parts to view in Home Concert Xtreme’s score display. Simply open the Mixer view and click the channel you wish to display. If you wish to see two parts, SHIFT-click the second part. Will Home Concert Xtreme tell me if I play wrong notes? Absolutely! When you use the Learn Mode, Home Concert Xtreme will stop and wait if you miss a note. If you have the keyboard display visible, you will also see the correct key(s) in red. You may also use the Play Performance feature to review your performance–any notes you missed will also appear in red. ...use play and follow most effectively? Because of the inherent delay in the mechanical playback of the Disklavier or other player piano system, it isn’t possible to use play and follow effectively IF accompaniments channels are assigned to the keyboard itself. Please set the incoming MIDI data to play through the tone generator (MIDI generated sounds, rather than the acoustic keyboard mechanism) for best results. How do I change the playback tempo? 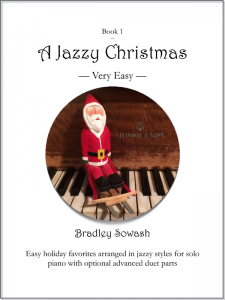 These MIDI files were recorded by well known Suzuki accompanist, Linda Perry. When she recorded them, she recorded them without reference to a metronome. Therefore, there are (1) subtle tempo fluctuations that are a natural part of any human performance and (2) there are specific places where she has put in a ritard or made a much more noticeable tempo change because the music calls for it. So, the tempo changes that you are seeing displayed as beats per minute are tempo changes that show this human and musical quality of her playing. What I suggest that you do is focus on the tempo % indicator. If you wish to make the piece slower or faster overall, then put the percent at 80% or whatever number seems appropriate. How do I update the SE version of Home Concert? The SE version of Home Concert 2000 and Home Concert Xtreme is no longer produced. If you purchased Suzuki or Music Tree MIDI files that came with this version, you can upgrade to the full version of Home Concert Xtreme for Mac or PC at a reduced price. 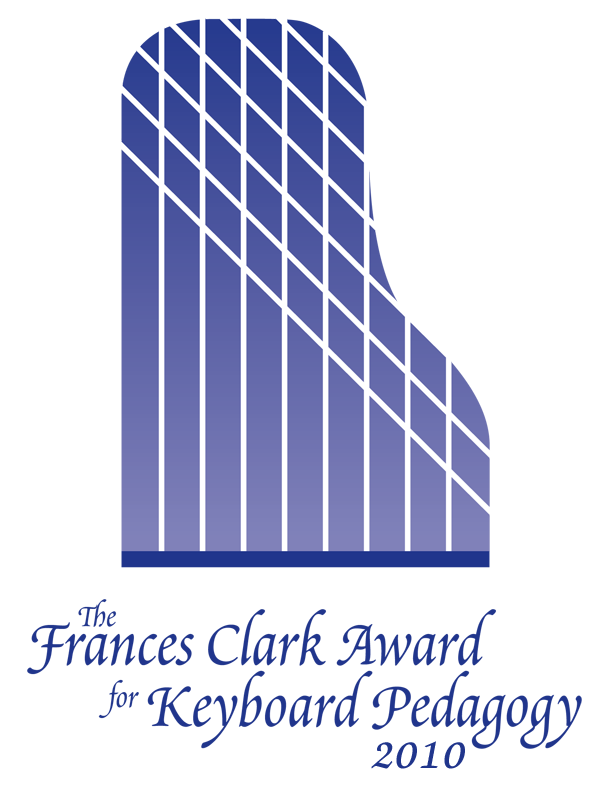 If you would like to upgrade, please use the “Contact Us” form, found at the top of this window, and send us a request. NOTE: The Suzuki or Music Tree MIDI files that you purchased can also be used with Home Concert Xtreme 3 for iPad. Home Concert Xtreme 3 for iPad can be purchased from Apple in the iOS App Store, using your iPad. There is no special discount offered for the iPad version as it is already discounted from the Mac and PC versions. Click or tap here to obtain Home Concert Xtreme 3 for iPad. How do I update the installed MIDI files for the SE version of Home Concert? Run the installer that came with the new set of MIDI files. The installer will add the new files to the existing collection of files. Both sets will become available from the File menu within Home Concert SE. There is no need to copy anything manually. 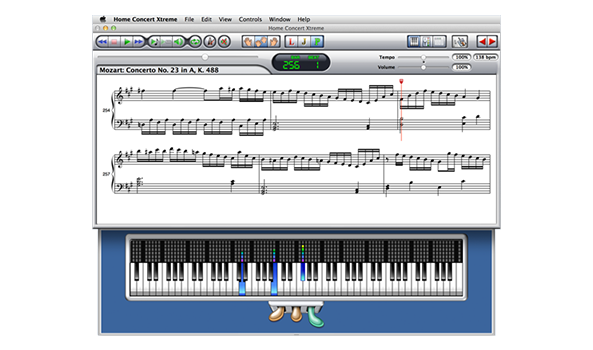 If you are using a new computer that does not support the SE version of Home Concert, you can copy the MIDI files from the CD or floppy disk that came with the SE product, and use those files with the MIDI player app of your choice, such as the full version of Home Concert Xtreme for Mac or PC or Home Concert Xtreme 3 for iPad. If you would like to upgrade to the full version of Home Concert Xtreme for Mac or PC at a reduced price, please use the “Contact Us” form, found at the top of this window, and send us a request. Home Concert Xtreme 3 for iPad can be purchased from Apple in the iOS App Store, using your iPad. There is no special discount offered for the iPad version as it is already discounted from the Mac and PC versions. I am playing on my keyboard, but the onscreen keyboard isn’t active. What could be wrong? First, check that you have set MIDI In and Out properly. How do I troubleshoot my MIDI connection? Some keyboards have a direct USB connection, meaning that the smaller, squarish end of the USB cable goes to the keyboard and the flatter one connects to your computer. If your MIDI keyboard or MIDI interface requires a driver, (this most commonly applies to many older products and most current YAMAHA products), make sure that it is installed. It’s best to check the manufacturer’s website to get the most recent version of your driver. With all your cables connected, restart your computer. If you use a Windows computer and didn’t have the driver installed before, you may get some instructions about configuring new hardware. I use a Yamaha Disklavier as my MIDI instrument, how can I.......eliminate the delay? How can I test my MIDI connection? Home Concert Xtreme provides MIDI diagnostic tools on the MIDI setup page. When you play keys on your keyboard you should see the globes light for whichever channel(s) your keyboard transmits. I am using the Windows GS Wavetable as my MIDI Output device. Why are the accompaniment tracks behind? 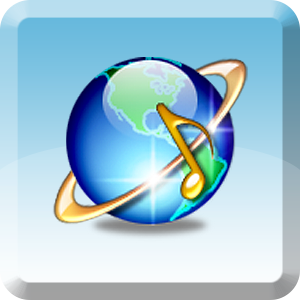 Unfortunately, many Windows computers are equipped with a set of MIDI voices which have latency, or delay in playback. We have found a simple work-around, using a third-party tool. Click HERE for PDF instructions. 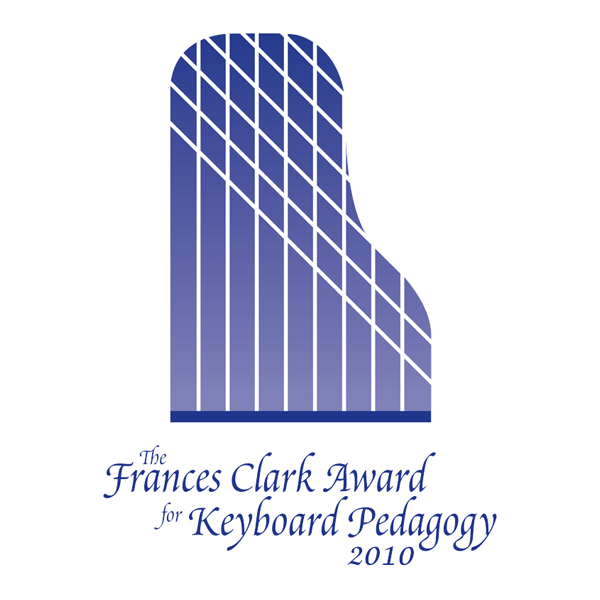 Home Concert Xtreme Is the 2010 Recipient of the MTNA Frances Clark Keyboard Pedagogy Award! This annual award was established by a bequest to MTNA by the renowned pedagogue, Frances Clark. 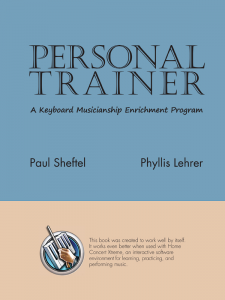 It is given to a person or company who has made significant contributions to the field of keyboard pedagogy through the creation and development of products and publications that further the profession…. 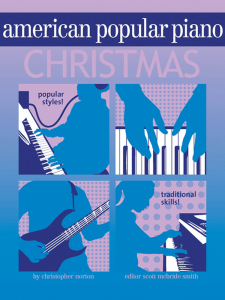 According to the committee, Home Concert Xtreme is a unique piano teaching and learning tool…. [The committee feels] that you have produced a most valuable teaching aid for use in the studio and in home practice, and that Home Concert Xtreme is the worthy recipient of the 2010 Frances Clark Pedagogy Award. I have repeatedly seen piano teachers’ jaws drop as they realize what the remarkable software Home Concert Xtreme is doing. I don’t know when I’ve been as excited about a program as I am by Home Concert Xtreme. Home Concert Xtreme is an effective teaching tool for students at all levels both as a practice companion and performance partner.